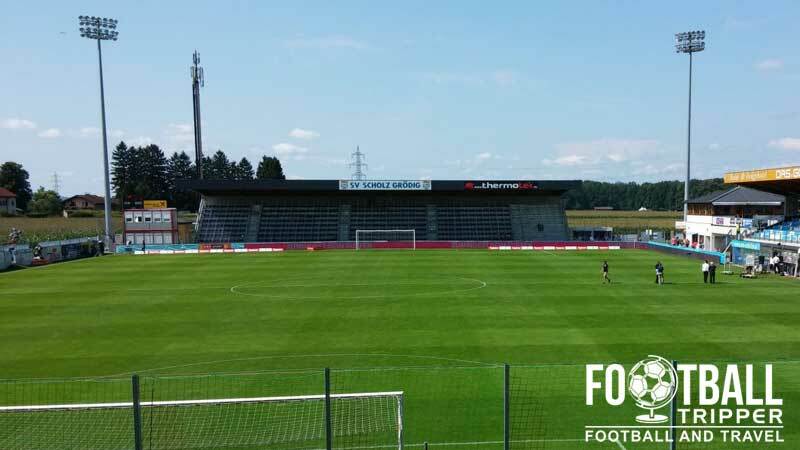 Sportanlage Grödig known as the Untersberg-Arena, and from the 2014/2015 season onwards, DAS Goldberg Stadium, is a football ground located in the West Austrian market town of Grödig. 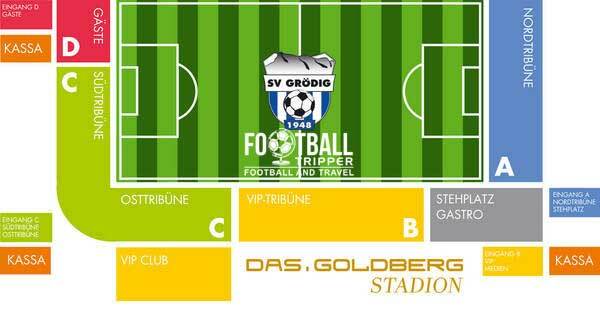 Home to local team SV Grödig, the 4,128 capacity stadium first opened in 1989 and was most recently renovated in 2013. SV Grödig’s current home first opened in 1989 with a capacity large enough to admit around 1,000 fans of the club to the stadium, originally known as Sportanlage Grödig. 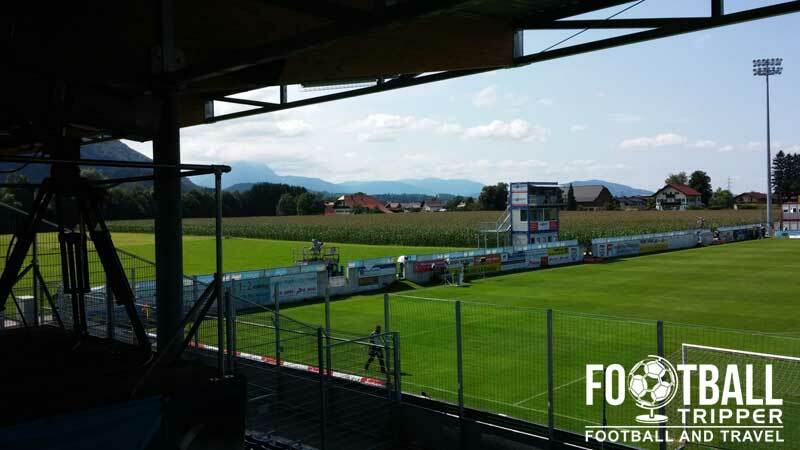 Back in the late 1980s the club was languishing in the lower tiers of Austrian football, and the establishment today in the A. Bundesliga is quite the remarkable journey considering that the local market town of Grödig has under 7,000 citizens as 2014. With the stadium increasing its capacity by over 400% over the 25 year period since opening, the history of the facilities is one of incremental improvements with piecemeal renovations made to firstly satisfy the increasingly stringent legislation of the leagues as they rose through the footballing pyramid and secondly, after growing their reputation throughout the footballing world, a growing fanbase. The first significant and permanent structure to be erected was the grandstand in 2007 which connected the pitch with the training ground facilities via a walkway. The blue and white structure which is branded with the name of the club was renovated a year later in 2008 to offer a further 300 standing spaces for fans, and during the 2010/2011 winter break, a 755 capacity stand was built on the eastern section of the ground. Promotion to the Bundesliga in 2013 saw the club choosing to expand the main stand to its current capacity and as a result to invest in the stadium’s infrastructure with a much needed roundabout built on Alpine Road to help relieve congestion on matchdays, following long held complaints from local residents. Combined with a new road to access both the stadium and training facilities, the stadium is now served by over 1,100 parking spaces and just under 20 spaces for coaches/buses. Goldberg Stadion is comprised of the four stands: North, East, South and West. Away fans are housed within the south-west corner of the ground as per the pink “gaste” section in the above seating plan. Visiting supporters should head to Eingang/Gate D into order to gain access to the stadium. 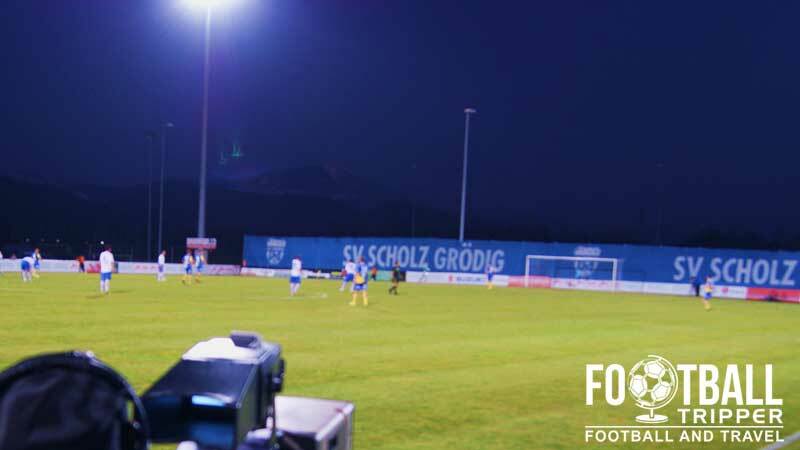 There is a SportsBar at the stadium within the main stand which is open Monday to Friday between 4.00 pm – 9.00 pm which offers cold beer and majestic views of the adjacent mountains. Whilst there there is a SV Grodig fan shop at the stadium it appears as if doesn’t open during the week and instead only opens when there’s a match on. You may wish to browse the range of official merchandise online instead. Unfortunately there aren’t any tours available of Das Goldberg Stadion however on the bright side you can walk round most of it when you attend a match. Tickets to see SV Groedig can be purchased online from the club’s official website and printed at home or obtained before on matchdays before kick-off from the tickets booths around the ground. 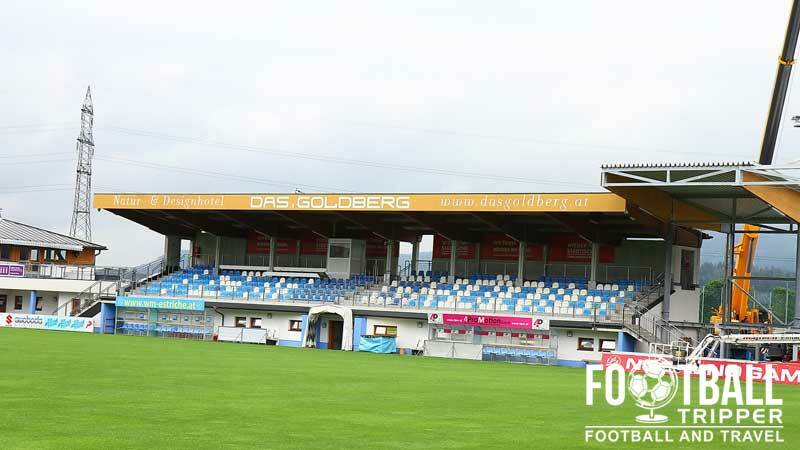 Das Goldberg Stadion is situated ever so slightly out of town just 1.1 km north-east of central Grödig across the A10 Tauernautobahn. The compact nature of the historic market town means that Football Trippers can walk to and from the stadium from most places within 20 minutes max. With one small car park at the stadium, parking appears to be very limited at the stadium. Unfortunately there isn’t a train station in the town with either Salzburg Sud or the one in Urstein being the closest to Goldberg Stadium. Welcome to Grodig. Mountains galore. The town is served by bus number 170 which stops twice along Hauptstraße which is the main road of Grödig. Salzburg Airport which is named after Mozart is only 13 km to the north of Grödig. Accommodation options within the small town are somewhat expensive and limited when you don’t have a car with Hotel Garni Sallerhof bei Salzburg, and Hotel Hubertushof both rated as four stars. The two more affordable options are Boutique-Hotel & Apartments am Essigmanngut and Gasthof Franz von Assi which are east of the stadium within the Neu-Ani neighbourhood.